Compact and light, the model XM35 is equipped with by-pass motors, clogged filter and tension indicators, ON/OFF indipendent switches, 4 mq cartridge filter with high filtration efficiency. Available also in the Longopac version, it is suitable for the suction of fine or toxic dusts. Many businesses are now 24-hour operations, or have long opening times, meaning there’s little time for cleaning. Once your business is closed for the day, you don’t want to spend hours cleaning, which is why a heavy-duty vacuum comes in handy. It quickly rids your floors of dirt and debris, and with HEPA or ATEX-certified vacuums available, all sorts of cleaning jobs can be undertaken. 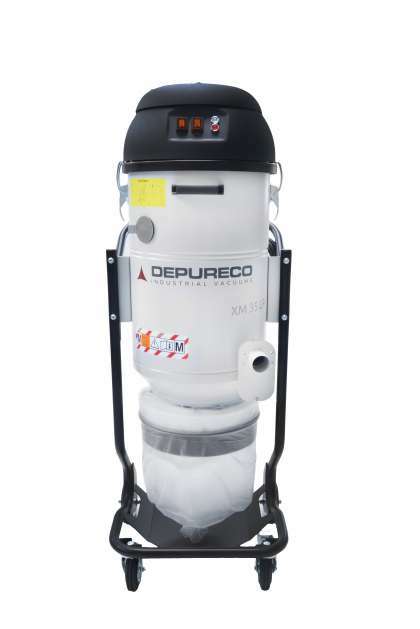 Depureco’s vacuum cleaners may be powerful, but they are designed to be user-friendly, with features such as wheels to make them easy to move. When you’re industrial vacuum cleaning, you want to be sure you catch all the debris, and our cleaners have excellent suction power, with features such as hoses to allow you to get into corners. Please email enquiries@depureco.co.uk and we shall respond ASAP. Make us your first point of call for all your Industrial Cleaning Requirements. We Service Nationwide.